WELL, I DID IT. HERE'S MY 'COLLECTION' THUS FAR. YOU CAN CLICK ON THE IMAGE BELOW TO ENLARGE THEM OR GO TO MY EX-VOTO WEBSITE TO VIEW THEM UP CLOSE. 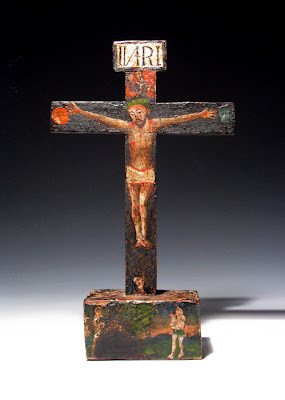 SINCE I'M STILL SICK, I'VE GONE THROUGH AND UPDATED MY WEBSITE, MOSTLY MY EX-VOTO PAGES, INCLUDING A SET OF NEW CRUCIFIXES I'VE JUST COMPLETED. I'M THINKING OF FIRING UP PHOTOSHOP AND PUTTING TOGETHER A MONTAGE OF ALL THE CRUCIFIXES I'VE COMPLETED OVER THE LAST COUPLE OF YEARS, SIMILAR TO WHAT I DID WITH THE WHITEWORLD DRAWINGS. I'LL SEE WHAT HAPPENS. THE MORE LIKELY SCENARIO IS THAT I'LL BE BETTER TOMORROW AND FORGET ABOUT IT. 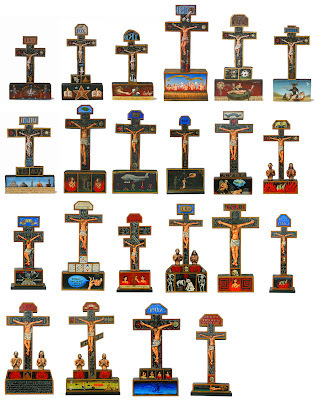 IN REGARD TO MY CRUCIFIXES, THEY ARE BASED ON THE MEXICAN-COLONIAL 'ANIMAS' CRUCIFIXES WHICH WERE CONSTRUCTED AND PAINTED BY ARTISANS AS A DEVOTIONAL OBJECT TO HELP YOUR ANCESTORS NAVIGATE THEIR WAY THROUGH PURGATORY. I USE THESE FORMS BECAUSE I OFTEN SEE THE ARTWORLD AS A SELF-INFLICTED PURGATORY, FILLED WITH ISSUES RELATING TO SURVIVAL, MORAL JUDGMENTS, SCRUPLES, POSITIVE CENSORSHIP AND UNJUSTIFIED NOBILITIES. SO I USE THIS FORMAT AS AN ANALOGY TO THAT, BUT ADD MY TWO CENTS IN THE DETAIL, KIND OF LIKE THE SUBVERSIVE USE OF THE PREDELLA IN THE RENAISSANCE. 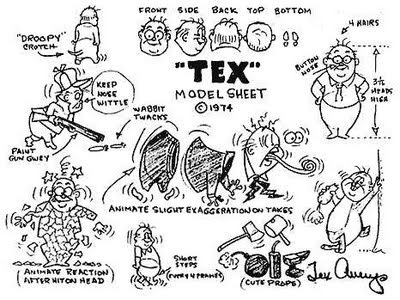 TODAY IS THE ANNIVERSARY OF TEX AVERY'S DEATH...29 YEARS AGO (HE DIED IN 1980). AVERY'S WORK ON LOONY TUNES WAS A GREAT INFLUENCE ON MY DRAWING AS A KID - TAUGHT ME A LOT ABOUT SCALE, ANIMATING THE FORM TO SHOW MOVEMENT AND EXPLOITING CARICATURE. I'D LOVE TO SHOW YOU SOME EXAMPLES, UNFORTUNATELY, I HAVEN'T YET SCANNED THE MANY DRAWING I DID FOR MY FATHER WHEN I WAS YOUNG. THERE MUST BE AROUND 40 - 50 FINISHED DRAWINGS IN HIS POSESSION. I MUST DO THAT THE NEXT TIME I'M BACK IN HAWKES BAY.